Pick a card, any card, says the magician. Though seemingly offered a choice to pick whichever card you want, in a majority of cases your brain has already fallen right into the magician’s trap. 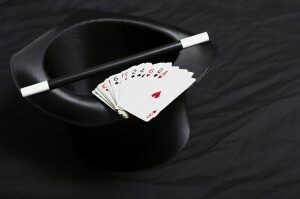 Pulling off a card trick doesn’t require spells or magic words — rather the magician’s key ally is the ability to subtly influence an audience to make key decisions while making the people believe they are choosing freely. In a study published Saturday in the journal Consciousness and Cognition, a team of Canadian researchers explored the psychology behind the magic. “We found that people tend to choose options that are more salient or attention-grabbing, but they don’t know why they chose them,” said Jay Olson, lead author of the study and a professional magician. To explore why people chose a certain card without being aware of any influence, Olson decided to test out some magic on the streets. Olson asked 118 people to choose any card by glancing at the one they wanted as he flipped through a deck. Unbeknownst to each of the subjects, Olson made a specific “target card” more prominent than the rest of the deck. In the end, an overwhelming 98 percent of participants ended up choosing the target card influenced by Olson, while nine out of 10 claimed they felt they had a free choice in the matter. As a follow up, the research team reenacted the flipping of the deck, except this time using a computer program which subtly kept the target card on slightly longer than all the others. Like the street version, participants were asked to choose a card while glancing, though this time they were to record their choice silently throughout 28 separate trials. This trick seemingly had less magic, however, as the target card was only chosen in 30 percent of the trials. Why the lower success rate for the computer version, despite using the same subtle technique? According to study co-author Ronald Rensink, it was “possibly because many of the social and situational factors central to magic tricks were absent.” In other words, the magic is not only in the trick, but also in the personality and performance of the magician. In addition to beginning to understand the psychology behind the centuries-old art of magic, the researchers also note that the study could help us understand why people make the decisions they do in everyday life. “These results show that combining real-world and laboratory research can be a powerful way to study magic,” the authors wrote, “and can provide new methods to study the feeling of free will.